If your child hasn’t discovered the simple pleasure and sweet world inhabiting the Mousekin books of Edna Miller, you’re in for a treat. Whether unlocking the door to fables, family, friends, or holidays, her books and accompanying pictures are charming and realistic, providing young readers with a trove of natural history information and, as Library Journal rightly said, “Miller again captures the quiet sense of wonder”. What could be more perfect on this Thanksgiving Day for children who daily face a world awash in the harsher realities of life that too many must confront at younger and younger ages. Wonder is not a bad place to begin and end childhood and Ms. Miller has done her share in the Mousekin series to perpetuate that elusive sentiment as long as possible. In “Mousekin’s Thanksgiving”, winter has set into the forest with its usual harshness and the daily scramble for edible food – and Mousekin is no exception. His secret stores of food have mysteriously disappeared – all those nut, berries and seeds – GONE! The one mysterious clue that falls on his ears in the forest is the unfamiliar sound of “gobble-gobble”! What the heck? As we adults know, a little knowledge is a dangerous thing as Mousekin hears dire word of mouth concerning the source of the strange sound. A dour woodpecker dolefully suggests, “ It was the biggest bird I’ve ever see seen and it might like mice!” A squirrel and rabbit are just as fearful in their descriptions of the “creature” that haunts the forest, making off with Mousekin’s munchies. But wait a sec. What if the woodland worriers are wrong and the large feathered bird is a protector of mice and even up to saving Mousekin from a predatory owl? And hey, as snow blankets the forest floor, hiding all the food the creatures need to make it through a “long cold lonely winter” as the Beatles sang, who do you think scratches up some grapes, dried apples, seeds and acorns from beneath the snow for the forest folk? Why ole Tom or Thomasina turkey of course. Goes to show, never judge a book by its cover, a person by a first impression or a turkey by a harmless gobble-gobble. Edna Miller’s books are classics that provide well researched material based on her hours observing and sketching wild turkeys, plants and assorted wild creatures on an island in Lake Champlain. Plus she lived in New York City quite close to the Museum of Natural History and her frequent trips there infused her illustrations with realistic touches. “Her appealing pictures and accurate nature lore”, enthuses School Library Journal, reinforces this series with reason enough to be thankful for such enduring classics during Picture Book Month. 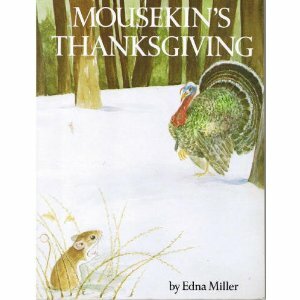 Happy Thanksgiving from Mousekin and Edna Miller! Gobble-Gobble! The book must display respect for children’s understandings, abilities and appreciations. The reason I so often select Caldecott winners for Way Back Wednesday blog entries or videos is because I feel that these stories have stood the test of time. And time is the great leveler. I feel they have something in their themes that still speak to consecutive generations, even though some of them were written 60-70 years ago. They may have fallen off the radar for many parents or grandparents who remember reading them in their youth and so one of my goals is to bring them front and center again for a new batch of readers to enjoy. Oh, how I love the Mousekin books! Mousekin’s Golden House and Mousekin’s Christmas Eve are just wonderful little stories!